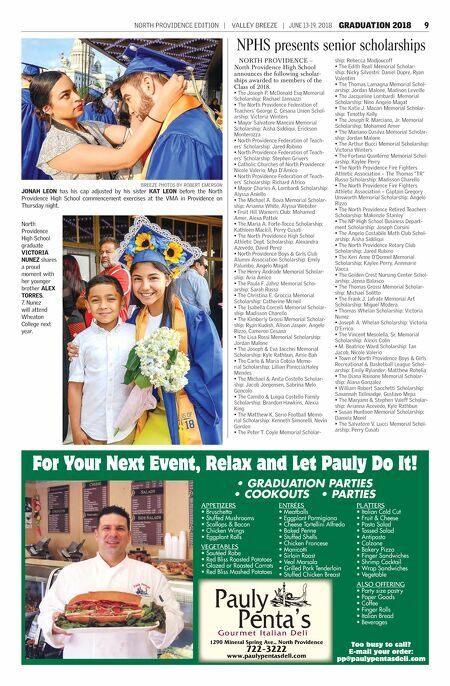 8 GRADUATION 2018 JUNE 13-19, 2018 | VALLEY BREEZE | NORTH PROVIDENCE EDITION North Providence High School Class of 2018 graduates Arianna Acevedo *†+ Richard Africo *†^ Jonathan Aldana William Almeida Dania Almuhtaseb † Christopher Alves Mohamed Amer *†^ Aria Amico Alexandra Andrade Alyssa Aniello *† Isabella Atkinson Piper-Lauren Aycock Alexandra Azevedo *†^ Amie Bah*† Jenna Balasco *†^ Axel-Demaude Bandoma Chanel Barroso Victoria Beland John Bevilacqua †^ Alexandria Brown Derick Cadet Hannah Caforio † Christopher Caracciolo Samantha Carbone Trebor Cardarelli Aaron Cedeño Sabrina Centeio Dylan Centracchio Cameron Cesana *†^ Michaela Champion Madisson Charello *† Jacob Cloutier Corey Clynes Alexis Colin Destiney Colón Matthew Cook Joseph Corsini *† Daniel Costa-Dupre Hailey Coulter Tony Cruz, Jr. Perry Cusati *† Haley Custodio Nicholas Daluz Selena D'Ambra Mya D'Amico *†^ Christina DeDonato Anthony DeMedeiros Tayla DeOliveira Victoria D'Errico *† Myson Diaz Gian Carlo DiNitto Matthew Dionne Emily DiPrete Scott Domenici † Shannon Donatelli Dylan Downing Gianna Duarte Rachel Elias Antonio Esposito † Edwin Estrella Brian Fallon Seth Fayard Vanessa Figuereo Alanna Forte Devin Fountaine Jacob Frezza Thomas Geremia Gian Geruso Amara Gibau Luke Giguere Ronald Giorgio Matthew Gliottone Kaitlyn Gomes *† Steven Gomes, Jr. Isabella Gomez† Alana Gonzalez †^ Nathalie Gonzalez Lorenzo *†^+ Nevin Gordon *† Gabrielle Granata †^ Stephen Grivers *†# Victoria Hamel *†^ Sophia Harvey Brandon Hawkins *† Kevin Hernandez † Bridget Holden Megan Hoxie Rachael Iannazzi *†^ Tessa Iannucci Victor Idowu Ian Jacob † Allison Jasper *†^ Carson Javery Ralph Jean Caden Jolcimat Jacob Jorgenson †^ Liam Joyce Alisa Kapp Timothy Kelly † Makenzie Kennedy † Alexia King *† Ryan Kudish *† Aaron Larkin Brenna Leo Jonah Leon † Madison Leveillee Brittney Luke-Medeiros Lauren Luke-Medeiros Jakob Lussier Jeffrey Lyman Kathleen Mackill *† Miguel Madera † Rebecca Madjoucoff † Niño Angelo Magat *†^+ Jordan Malone *† Jonathan Mariorenzi Helena Marsella Alexandra Martinez Amber Marzocchi Tyler Marzocchi Jamilah Matanmi† Marissa Mazzei Matthew McGill *† Tanisha McGill Catherine McNeil *†^ Aaron Means Alex Medeiros Gustavo Mejia Diego Melo Sabrina Melo Goncalo *†+ Hailey Mendes † Nicholas Mollo Mona Mondesir Gianna Montella Erickson Monterroza *†#+ Daniella Morel *†^ Vincent Mucci Philip Nasisi Arame Ndiaye Marieme Soda Ndiaye Jocelyn Nichols Victoria Nuñez †^ Nathan Nye Jorge Luis Orellana John Owens Timothy Oyedokun Shane Paliotti Emily Palumbo *†^ Lillian Paniccia † Theron Papineau Alexa Pattek *†^ Tyler Pedro Javan Pereira Kevin Pereira Christopher Perez David Perez Samantha Perez *†^ Kaylee Perry *† Michael Pesaturo *† Keyri Pogio Gil Julianne Quiroz Gilbert Ramirez Thomas Rankin Kyle Rathbun *† Jayda Reed Alycia Regniere Tatiana Reno † Paul Ricci, Jr. Daniel Rivera Angelo Rizzo *†^ Paul Rizzo Anthony Rodriguez Ezequiel Rodriguez Hector Rodriguez Matthew Rohelia Mason Ross Jared Rubino *†^ Joshua Ruiz Sarah Russo *† Emily Rylander *† Japheth Saenz + Danny Salcedo Anthony Santos Wayne Santos Keren Serpa Brian Shabo Kameron Shepherd Aisha Siddiqui *†# Jason Silveira Nicky Silvestri Kenneth Simonelli III *† Rebecca Smart Justin Solan Michael Sollitto, Jr. *† Mackenzee Stanley Crystal Stepinski † Savannah Tallmadge Brandon Tanguay Sean Terpening, Jr. Tamar Toles Jenna Tronni Stephanie Tudela †+ Anna Maria Vacca † Ryan Valentim Nicole Valerio *†^ Angelo Vecchio, Jr. Richard Vecchio Christopher Venditti Camron Viccione Krystofer Viera-Rosario Alyssa Webster Ariana White † Noelle Wilburn Rowan Williams Victoria Winter *†# Alyssa Wood Adekunle Yusuf * Denotes National Honor Society † Rhode Island Honor Society # STEM with Distinction ^ STEM + Seal of Biliteracy BREEZE PHOTOS BY ROBERT EMERSON Class Salutatorian ERICKSON MONTERROZA, fluent in three languages, presents his speech in English at graduation exercises Thursday night. North Providence School Supt. 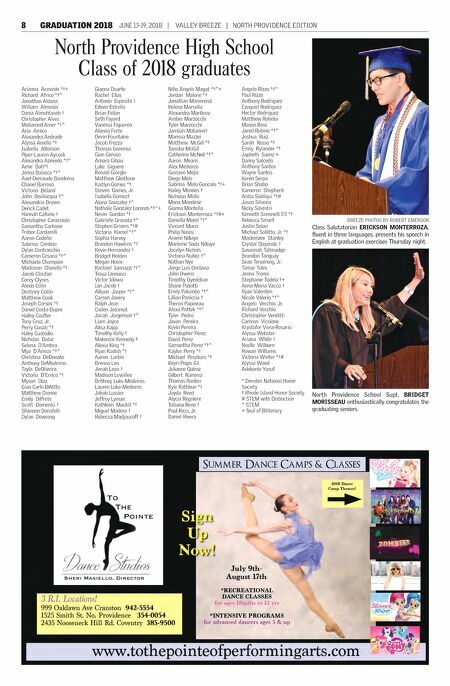 BRIDGET MORISSEAU enthusiastically congratulates the graduating seniors.